Jungle Red Writers: WHY DO WE LOVE WORLD WAR TWO? Why are we suddenly so fascinated with World War Two? Today I was sent a link to a Book Bub mailing, recommending World War 2 novels to Book Clubs. Fourteen titles in all, published this year. Fourteen new books and the year isn’t nearly over yet. Mine was one of them, of course, and I have been thrilled by its success. But why this sudden fascination with World War Two? Personally I put it down in part to the current political climate: to the similarities we see with hate groups and marches and exclusive rhetoric, all of which makes us feel uncertain and afraid of what might happen next. Perhaps it is comforting to read about a similar time and to know that good finally prevailed. I think we are drawn to stories of World War Two because it was the last clear time of good versus evil. Every war since then has been clouded in ambiguity, with no clear mandate of doing the right thing. In my WWII story I show rural England and a population driven to serve, to protect and defend if the Germans ever invade. And also we are aware that the last survivors will not live much longer. We must preserve the stories, lest we forget. And how soon that is! A Jewish writer friend went to talk to a school and said that her grandmother had been in a concentration camp. “What had she done?” the children asked. “She was Jewish,” my friend said. They looked puzzled. “Yes, but what had she done?” They couldn’t fathom that someone could be imprisoned or killed because of race. And yet we know that crimes of violence that are racially motivated are still happening. We must make sure coming generations never forget. You might think that fourteen new books are an excess. And these were only the recommended titles. There are probably many more. But the interesting thing is that the stories rarely overlap. Because it was a world war there are so many stories, so many points of view: the homeland tales in England and America, the Resistance in France, Jewish stories from all over Europe, battle tales of invasion, harrowing tales of occupation and even stories from the German perspective. 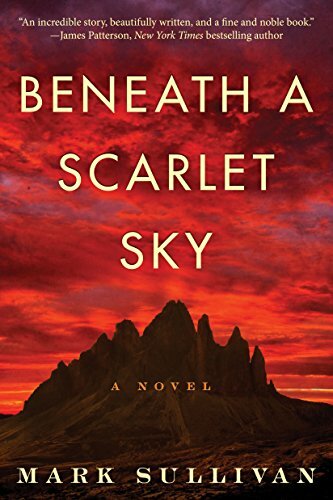 My next stand-alone novel features a British pilot who is shot down over Italy. So many stories still waiting to be told. Have you read a World War Two novel this year? This year, so far, I have only read one and that would be your book, Rhys. It was wonderful! But last year I read at least 3, maybe more but time goes by so fast I'm not sure just what year I read what book. Always looking for a good story and as you have said there were so many stories with that era. 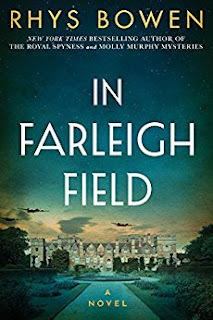 Rhys, In Farleigh Field is on my list of books to finish this year. For me, the stories of WWII are personal. My father fought in the Pacific War, in New Guinea and the Philippines, where he was wounded and came home. He never spoke about those years to us, so that when I wanted to understand more about what that service had meant and how it had shaped the man I knew, I had to go digging. As a little girl, I vividly remember the fear in our household when President Kennedy stood up to the Russians over Cuba--the fear that war would break out yet again. So, I have always been fascinated by these stories. And now, you are right, I think, on so many fronts--soon there will be no direct witnesses to the horrors of that war, and today seems to be brimming with the kinds of idiocies that led to a war that raged across so much of the world. Two this year, your book and The Wives of Los Alamos. I am giving brain room to writing one that will be loosely based on my MIL who was a WAAC in WWII. How can you not tell the story of a woman who drank beer ice cream floats and once when hitching a ride back to her home field told the male pilot to "take his *&%$ parachute back and land the damn plane or she would." She later confessed that while she knew how to fly, she had no idea what to do with all the straps on the parachute and figured it would end up around her neck. She preferred a fast death in a crash if it came to that rather than a slow death by strangulation floating to the ground. I think the fascination with WWII is natural. The world was so different then that it seems exotic now. We are among the last generation who have heard the first hand accounts of WWII which makes them read differently from stories built solely on research. And, Rhys, as you say, it was the last clear cut good v. evil war we participated in. I've had two experiences with World War II "entertainment" this year. I've been watching the DVD set "Foyle's War" which is about a cop in the south of England during World War II. It belonged to my mother and as I pare down all the DVDs she had, I wanted to check that one out. As for a book, I have read William Christie's A Single Spy and I just loved it. It is one of the best books I've read so far this year. I got an advance copy of it and did the Mystery Scene review. How good was the book? I want a sequel, even though it really wouldn't make much sense if there was one. This year, so far, I've read four or five, including yours, Rhys. It does seem that the First World War period, and the time between the wars dominated mysteries, in particular, for awhile, and now the focus is more on WWII. But remember the 70's and 80's? Herman Wouk's Winds of War series was big then, as well as Ken Follett, James Clavell, Leon Uris, Jack Higgins. 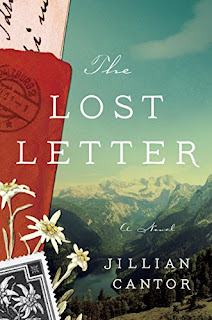 The real change, to me, is the number of women writing about this period: Kristin Hannah, Jacqueline Winspear, Sarah Blake (The Postmistress), Laura Hillenbrand, Susan MacNeal, Charles and Caroline Todd. I just thought of another WWII book I read this year, a bit older, but different, and very good: Fanny Flagg's The All-Girl Filling Station's Last Reunion. Not a mystery, per se, but a unique slice of American life based on a real set of women. Does anyone besides me wonder what got posted and then removed? Did you drop the F bomb Hank? Aside from “In Farleigh Field,” the only other World War II story that I’ve read this year is Boonton Herndon’s excellent “Hero of Hacksaw Ridge,” a true story of a conscientious objector who joined the army and served as a medic. 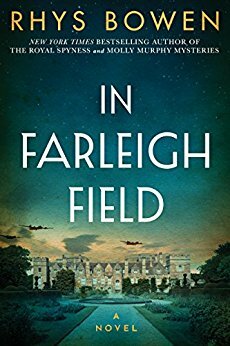 “In Farleigh Field” remains one of my favorite books . . . . I think the interest in these stories stems in part from how well they are told and from a desire to understand how the world survived that difficult time, especially when everything seems so unsettled these days . . . .
You said exactly what I was thinking, Joan. I think we do look back at the past when we are trying to figure out the present or the future. Rhys, one of the aspects of your novel In Farleigh Field that is unique compared to most I've read is the pro-German sentiment of some people in England, some important people. I was surprised and so interested to learn about that. I knew that the Prince of Wales and Wallace Simpson had some German sympathies and even visited Hitler after they were married, but it's hard to believe that there were active cells of English people who thought a German victory would be best. And, of course, your latest Lady Georgie book, Rhys, gave us a look at the Prince and his German sympathies before the war started. I've recently read Susan Elia MacNeal's latest Maggie Hope novel, The Paris Spy. It, too, was a great story and highlighted the dangers that spies were willing to face in order to defeat the Germans. WWII has been a favorite reading interest of mine for years. It probably started with my interest in the Holocaust and all the reading I did on that. I have a desire to read the personal stories of struggle and survival, how people were able to keep their wits about them and not lose their minds in a time of madness. And, it does give me some hope that good can still triumph over evil. I think it's important that we are reading about WWII and all of its evil now, so that we don't forget what can happen. I think WWII continues to fascinate because it was so extreme, with truly global reach, mass genocide, rationing, bombing the likes of which we had never seen, and all very up close and personal. The United States hadn't seen war on our soil since the end of the Civil War, until the attack on Pearl Harbor. Nobody escaped the reach of WWII. But I'm not so certain this year is any more remarkable in our fascination with the war than any other year. Like Jay, I've been watching Foyle's War episodes. Foyle first hit our screens in 2002, and surely was in development for a year or more before that. Susan's Maggie Hope series first came out in 2012. The most interesting book set in WWII that I've read lately is Peter Robinson's In A Dry Season, with a split timeline between a modern investigation and a death that happened in 1943; it was published in 1999. I do think there may be more urgency to our interest as the generation that fought the war passes away. My father, who fought in the Pacific, will be 93 this year. If he doesn't talk about it now, he won't have many more chances. The Bletchley Circle! And I adore your book, Rhys. We just saw the movie Their Finest, about making propaganda movies in WW2, and I loved it! ( except for one silly part) --it is absolutely a writers movie. It was just such an intense time--and a time where good and bad was clearly delineated. Plus each of us has a way that we are personally connected to it, you know? Rhys and Deb, I just got through reading "By the Book" in today's NYT. Big BIG congratulations on being mentioned as two of Louise Penny's favorite authors, along with Agatha Christie, Shakespeare, Ann Cleeves, Josephine Tey, PD James ... talk about rarefied air! I am so pleased for you both, and I hope this triples your already voluminous sales. You are a pair of winners for certain. Thanks, Ann! That is so lovely of Louise, but then she is a lovely person as well as a wonderful writer, and so generous! Rhys and I are indeed in good company! Re WWII, I, being perhaps the oldest here, was born in December 1940. My father, two uncles, an aunt and her lover, all served in the armed forces. My father was a Naval officer in the South Pacific, one uncle flew B-29s in SE Asia, one uncle lied about his age and got in the Navy but the war ended before he could get on a boat, and my aunt and her lover were drummed out of the Navy for being lovers. BTW, they were together more than 50 years. Anyway, I cut my teeth on that war, and there was never a doubt who was right and who was wrong. I love reading books and seeing movies about that era although all I personally remember is playing Japs and Germans with my playmates, no kidding. Not very PC was it? I don't remember what WWII books, other than In Farleigh Field, that I've read this year. I did just watch "Hacksaw Ridge", a great movie based on a true story about a conscientious objector. Right now I am beginning another news blackout because the current political climate makes me ill, so keep writing books my friends. It's my favorite entertainment. I have read two books set in WWII this year -- In Farleigh Field and Jacqueline Winspear's In This Grave Hour. I loved them both. Also read Ellen Umansky's The Fortunate Ones, a very good book that had significant flashbacks to WWII. I agree that one of the great draws of this era is that there was such clarity about good versus evil. Ann beat me to the punch, but I also want to congratulate Rhys and Deb for their mention by Louise Pennyin today's NYT Review of Books. Mentioned in the same sentence with Shakespeare and Agatha Christie -- can't beat that! Thanks, Susan! And I love Jacqui Winspear's books--this one is going on my list. Oh yes. I do read books set in both the World Wars. Enjoyed In Farleigh Field Rhys! Dad and father-in-law were both WW2 veterans. The war influenced the lives of all us boomers even though we weren't around. Ugh. Watching the news here in Houston and seeing all the flooding. We aren't going to be driving anywhere anytime soon. Pat, thinking of you. Hoping you are not likely to flood! Stay safe, Pat! And thinking of all our Houston friends. A wonderful WWII series which hasn't been mentioned is James Benn's Billy Boyle series. I'm behind, I have to admit, but these books are well worth catching up on. Thinking about our current interest in WWII, Saving Private Ryan came out in 1998, almost twenty years ago. We are fascinated by this war for all the reasons mentioned above, but I think now this is strengthened by our sense of loss, as the last of the veterans will not be with us much longer. And by fear, as we begin to think that the freedoms so valiantly won could be thrown away. Hacksaw Ridge and Their Finest are on my watch list. And I highly recommend Dunkirk. See it in the theater if you can. It's just stunning. It was shot on film rather than video and should be seen on the big screen for full impact. Debs I have hesitated to see Dunkirk as I thought it would be full of blood and gore, but I'm told this wasn't so. So I'd better see it. And congrats on being included in Louise's list! Eager to hear how you like Their Finest--except for that one thing, it is wonderful--and such a writers' movie! Rhys, Dunkirk is not gory at all. And it's not about the battle beforehand, or the context of the war, really, but about what it was like to be there. I didn't read reviews beforehand and am glad now that I didn't (NYT had a big spoiler) but it's helpful to realize going in that there are three interconnecting timelines--one week for the soldiers on the beach, one day for the rescue vessels, and one hour for the pilots in the air. I did figure it out eventually and it all made sense. There's not much dialogue but the performances are superb, and the soundtrack (Hans Zimmer) and the cinematography are astounding. We absolutely loved it. Thanks for the recommendation, Debs. I had been waffling about it. At the beginning of this year, I read Kristin Hannah's The Nightingale. Mom just listened to In Farleigh Field last month, and she really enjoyed it. She is 85 and can't concentrate on reading anymore, but love the audio stories. I'm so glad most of the recent books have been on either MP3 or CD! Most of us are fascinated by WWII because of the personal stories of the survivors. We Were The Lucky Ones is a great WWII book I read recently. I too am fascinated by WWII...have read In Farleigh Field, In This Grave Hour, Lilac Girls, Paris Spy...loved them all. And saw Dunkirk which I highly recommend as well. We need to be constantly reminded of what racism, discrimination and intolerance can lead to...especially if those who oppose it remain silent. I grew up watching Combat, The Rat Patrol and WWII movies. I read Rhys' book and The Paris Spy. My dad worked on planes at Lock Haven, his eyesight being as bad as mine. My mother and aunt wrote letters to various soldiers. It was a time when the country was united. So many wonderful thoughts and suggestions today. First of all, Rhys, In Farliegh Field is my absolute favorite of all your books. I loved it and hope it is just the first in a new series. Are you planning more with those characters? (Say yes!) Secondly, I too have been fascinated with WWII in the past few years. My Dad is now 94. He fought in the South Pacific with the US Navy. Believe it or not, he told me only last year how a book saved his life during the war. He still is and has always been a voracious reader. He had a PB book in his shirt pocket. The ship got hit and a piece of shrapnel flew at him and was lodged in the book. Had it not been for the book in his pocket, the shrapnel would have gone into his heart. Unbelievable. I wish he could remember the title. I'd love to know what book it was. I think the time is very popular, because for many of us our fathers and uncles, and some of our grandparents, fought in World War II. I grew up hearing stories of romance and loss but little of the real detail except the worst that I learned in school or saw in books that my father had hidden under the bed. He didn't want me to see the photos from Germany. He spent most of the war in Russia delivering supplies and taking turns with his shipmates firing the one gun they had mounted on their ship as German planes flew overhead on their way to attack. My parents' romance story was my father's proposal of marriage if he were to return but told my mother to date other boys in case he didn't come back. He told me he was certain he would die in the war and believed that was how he managed to survive. We have many family secrets about the war too. When my father was dying he gave me all of his papers and letters from those days. I am still reading them, but I must stop for long periods of time in order to digest the stories I had no hint of, ever. Why do we love books about World War II? As Rhys said, I agree it has something to do with the current political climate. I also think it was the last war when it was a clear cut difference between good versus evil. I think of movies in Black and White when I think of WWII because I grew up seeing WWII movies in Black and White. I loved seeing old movies made when my parents were kids. P.S. 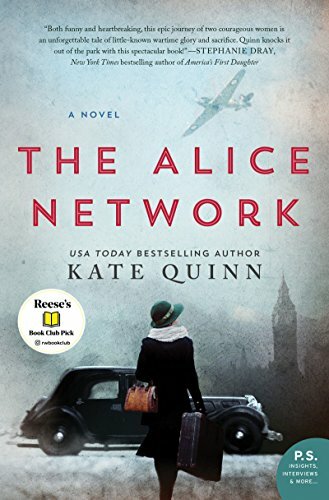 I discovered the Alice Network through a book group on Social Media. Have not read any this year :( Gonna find one. Thank you for sharing the post!